Good quality (and Best quality) work gloves are absolutely essential for protecting one’s hands from the countless harsh and abrasive tasks of a ‘working’ daily life. Also knowing that an ordinary cut can quickly lead to infection (many people used to die this way before antibiotics), wearing work gloves is a wise precaution – especially post-SHTF. Work gloves are a ‘must have’ for your preps. 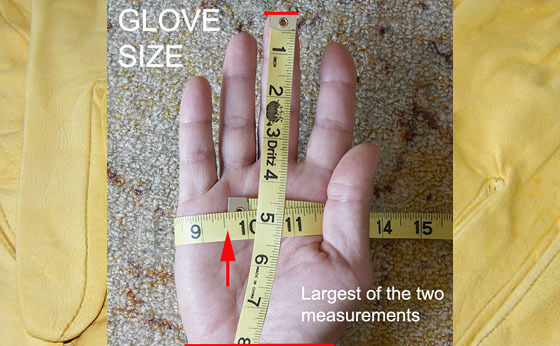 Measure the circumference of the hand that is used the most (it tends to be slightly larger) with a tape measure around the palm (at the fullest part excluding the thumb) as shown. Then measure from the tip of your middle finger to the bottom of your hand. 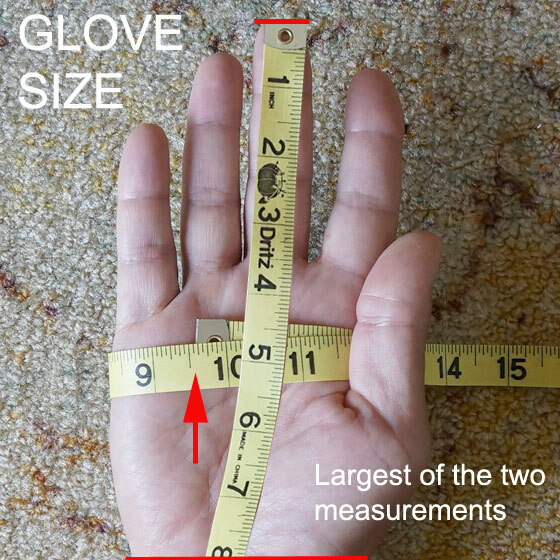 Use whichever measurement is larger for your glove size. How many of you have AT LEAST several pairs of work gloves? Even good quality work gloves will wear out. So be sure to have more than just one pair! Gloves might be a very overlooked prep item in one’s storage of goods and supplies. Consider the tasks at hand in a world in which you are required to do more yourself. Some gloves will be necessary for very heavy work while others for medium duty work. Some tasks may require better dexterity and tactile sensation for handling tools and such. Quality gloves will be made of materials that will hold up better to abuse than ordinary cloth gloves. Pay attention to the materials that the gloves are made of. The palms of good heavy duty work gloves will often have thicker leather or even a double layer, as well as extra stitching or double stitching. Cowhide is the most common leather, although not as good or durable, or with the dexterity of Goatskin or Pigskin leather gloves. If you’re prepping, you better have lots of work gloves, and not the cheap one’s either. Those cheap gloves will tear right through if you’re doing any real work. ‘Many people used to die this way before antibiotics’ So much for colloidal silver being a cure-all. It may have its uses, but NOTHING cures everything. We are all likely to be doing more manual labor when the SHTF. We actually save all the gloves even when they wear out in one spot. Depending on the type of labor those gloves can still be used for certain chores. We also have multiple sizes. That’s so we can double up in some cases. I’ve NEVER been able to find gloves large enough to fit my hands! The “mechanics” gloves are tops for some chores. They allow feeling and picking up small things. Might be better too toughen up the hands now, before you really need them for survival, and don’t have antibiotics. I currently count 9 minor cuts, abrasions, and split open blood blister on my hands, all occupation related. I rarely wear gloves, haven’t had a tetanus shot in around 12 years, and might wash my hands twice a day… yet I’m rarely ill and almost never get infection from hand injuries. Just like toughening the skin on the hands, you can also toughen up the immune system. Kind of a “use it or lose it” concept. I agree there is no substitute for cleaning a cut but he does make a valid point. If you toughen up your hands now they don’t cut as easy and you don’t get blisters etc as easy. I spent half my life working construction and while I haven’t done that work for years I still have callus build up on palms finger tips etc. I am also in agreement about building up immunization. Half the reason ( imho ) people get sick is that their body gets shocked if they get any sickness and they don’t have the natural antibodies to fight it. yes, toughening up your hands will help avoid injury, and i agree that some exposure to germs can boost the immune system (the “hygiene hypotheses”), but in a shtf situation or worse, you will probably be malnourished, stressed-out and sleep-deprived–and all of those factors will wreak havoc on your immune system. so even if you don’t need to disinfect now, you would be smart to start doing so as soon as the balloons go up, as they say. Years ago I had a summer job in a factory wrapping electrical tape around clothes dryer switches. We wrapped our fingers in old, white cloth tape. However, the best idea (from my boss) was to coat fingertips with merthiolate at bedtime. Washes off during the morning shower. Fingers became rougher, but better to grip the electrical tape. Can we buy merthiolate anywhere now? What is a close substitute? “Working Hands” in round green jar works well on cuts & scrapes. I bought a pair of small at Sams Club a couple of days ago & they are too big. I have a hard time finding the extra small. It is difficult to do anything when the gloves don’t fit right. Extra small gloves…look in kids dept. or buy fur-lined ones in a small size. Or use glove liners…cotton gloves or find cheap stretchable ones during the winter in the craft/dollar stores. Academy (or similar stores) probably has liners for winter gloves.